The Border Terrier originates in, and takes its name from, the area near the border between Scotland and England. Their original purpose was to kill foxes and rodents, but they have been used to hunt otters and badgers too. 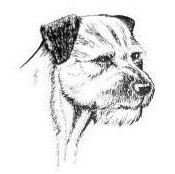 The first Kennel Club Border Terrier ever registered was The Moss Trooper, a dog sired by Jacob Robinson's Chip in 1912 and registered in the Kennel Club's Any Other Variety listing in 1913. The Border Terrier was rejected for formal Kennel Club recognition in 1914, but won its slot in 1920, with the first standard being written by Jacob Robinson and John Dodd. Jasper Dodd was made first President of the Club. Identifiable by their otter-shaped head, Border Terriers have a broad skull and short, strong muzzle with a scissors bite. The V-shaped ears are on the sides of the head and fall towards the cheeks. Acceptable colours are grizzle-and-tan, blue-and-tan, red grizzle, and wheaten, all colours with a dark muzzle preferred. White is not allowed, except for a small patch on the chest. Whiskers are few and short. The tail is naturally moderately short, thick at the base and tapering. Narrow-bodied and well-proportioned, males stand 13-16 inches at the shoulder, and weigh 13-16lbs. Females 11-14 inches and 11-14lbs. The Border Terrier has a double coat consisting of a short, dense, soft undercoat and harsh, wiry weather and dirt resistant, close-lying outer coat with no curl or wave. This coat usually requires hand stripping twice a year to remove dead hair. It then takes about eight weeks for the top coat to come back in. For some dogs, weekly brushing will suffice. Affectionate, intelligent, even-tempered, and obedient. Alert and fearless. Border Terriers generally get along well with other dogs, however, if they dislike another dog, they do not hesitate to start a fight and, as with most terriers, it can be difficult to stop them. Red grizzle.They will get along well with cats they have been raised with, but will chase other cats and small animals such as mice, rabbits, rats, and guinea pigs. Borders will adapt to the activity levels of their owners. They do not demand exercise, but do love it when they get it. With sufficient length of leg to achieve reasonable speed, a Border will hike, bike, and run with its owner but just as happily while away the day lying in the sun. A Border Terrier does not mind being left alone but as it is intelligent and loves company, it is not suited to household where people are away all day, every day. Being bred to work cooperatively with people, Borders do well in task-oriented activities. They are intelligent and eager to please, but they retain the capacity for independent thinking and initiative that were bred into them for working rats and fox underground. They take training for tasks very well, but appear less tractable if being taught mere tricks. The breed has excelled in agility training, but they are quicker to learn jumps and see-saws than weaving poles. Their love of people and even temperament make them fine therapy dogs, especially for children and the elderly, and they are occasionally used to aid the blind or deaf.